One of the main selling point of the ADG canvas is its extensibility. In this page are shown three different ways of implement the same application with different strategy. Any approach has different advantages and disadvantages... there is no universal approach so every application stack shown below does not try to fit everywhere. The official ADG tarball provides an adg-demo program that shows some of the features of the canvas without the need of installing additional stuff. It is also possible to run it without installing ADG itself. Once the project is built (and before installing anything) the demo program can be started from builddir (that is the directory where you called make) by using the demo/adg-demo-uninstalled command in the terminal. After being installed, the program is renamed to adg-demo, so if you want to call it after having installed ADG, just write adg-demo. This also avoids any clash between installed and uninstalled version, so you can run an uninstalled version of adg-demo with an old library yet installed in your system and be sure the proper files are used. 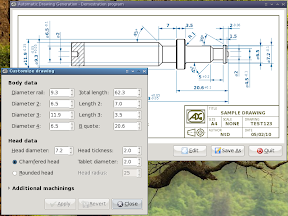 Although the ADG is not expected to be used from C, the adg-demo program shows it is possible. This can be sometime useful, such as on a constrained environment or where performances are an issue. Anyway this approach is generally discoraged: C is a great language but its bright side is not exactly maintainability and dynamicity. Having to deal with drawing generation, where things change quickly and rapid prototyping is a strong requirement, means you need a dynamic programming language that let your application evolve together with the final drawing. This also explains why a lot of effort has been put together to have language bindings availables and supported as first class citizien. The data map on the right shows how actors interact together in adg-demo to provide the final result. 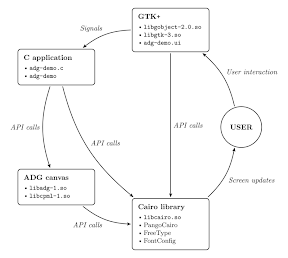 The communication between the user interface elements (handled by GTK+) and the drawing logic (based on the ADG library) happens throught Signals, so alghouth the source is a single file, the user interface code and the drawing code are effectively decoupled. This is a fundamental point: libadg does not depend on GTK+, so the ADG canvas can be effectively built on headless server by using the --without-gtk option. adg-demo.lua provides an example that shows how ADG can be easily accessed from the Lua language. Basically, it is a rewrite from scratch of the C demo application previously described. elaborating data. 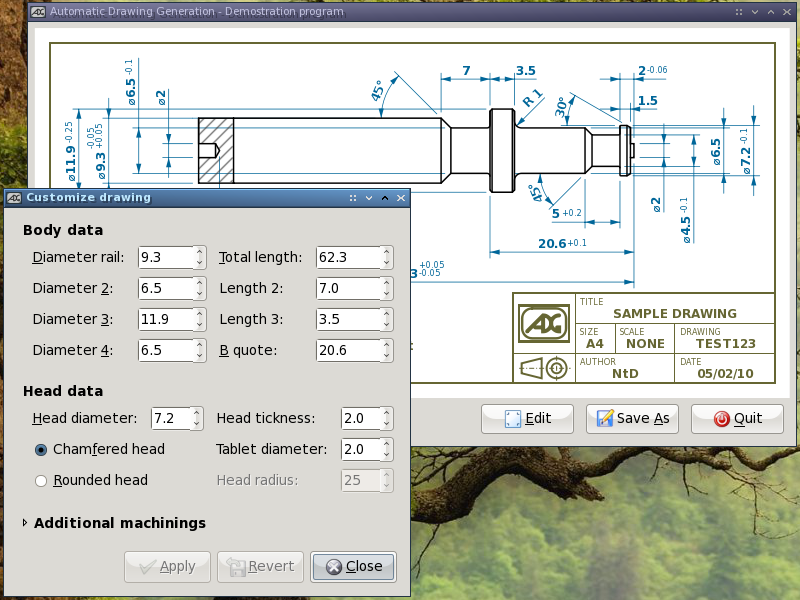 that is generating the needed drawings from the available data. The ADG project does not make any assumption for (1), leaving any door opened. 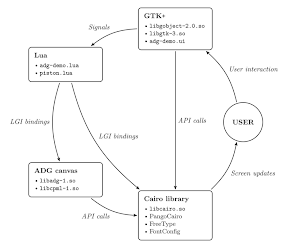 Data can be collected via HTTP protocol in a web application, with GTK+ on a graphical desktop or throught arguments on command-line scripts that do not require user interaction. For (2) instead, any kind of tool that can be remotely useful to simplify the generation of the drawing is provided, relying on cairo for abstracting the output formats. 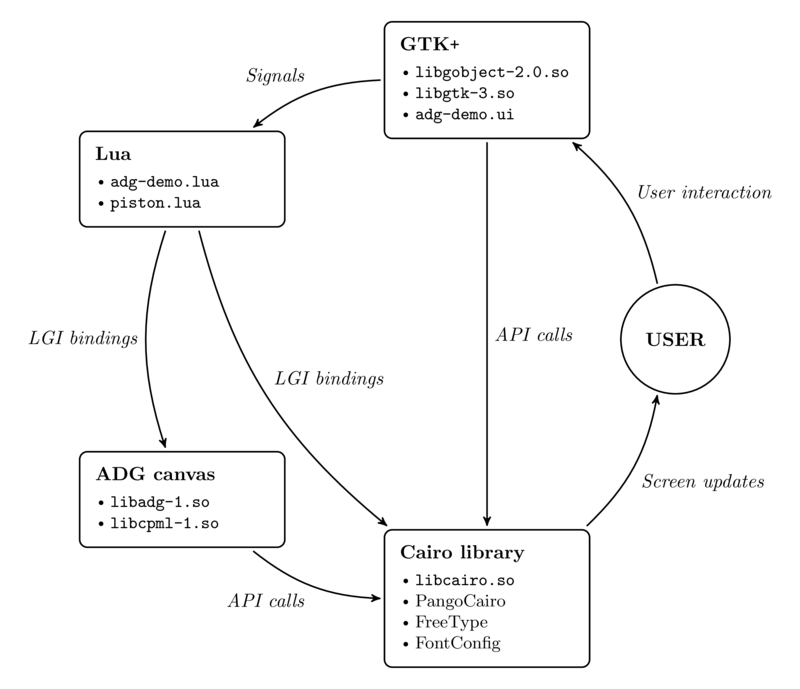 The data map on the right shows the interactions between the elements of the adg-demo.lua application. 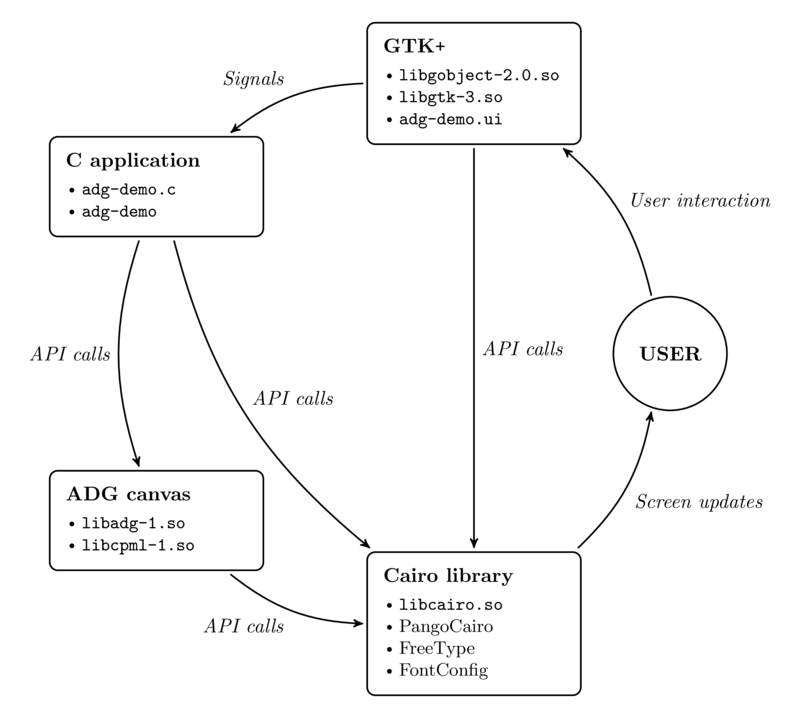 While ADG canvas and Cairo library elements are fixed, the other actors can be easily interchanged to provide another kind of implementation that fulfills the same task. Turning back to the stock C demo, thethe only actor that changes is the Lua node substituted by a C application. As stated by the feature list, the ADG canvas can be easily used in web-based applications. The demo described here is available online and it will be kept up to date, so it can be used to test the status of the latest release too. First of all a couple of clarifications. This is a demo program! An ADG based application is capable of generating any kind of drawing expressable by the availables entities. A piston has been used because it was a real case study. The application is not locked to the web technology here described. PHP and SilverStripe have been choosed simply because they were yet availables out of the box on this web server. ADG and cairo, for physically generating the technical drawing. This requires manual intervention to set up the server, because a typical web server will hardly met all the above requirements. The online demo has been deployed on a CentOS 5 web-server, so PHP and Apache were yet availables as part of the LAMP stack. The platform is fairly old (CentOS 5 has been released on April 2007) so it has been also used for testing the "adaptability" of the project on outdated systems. 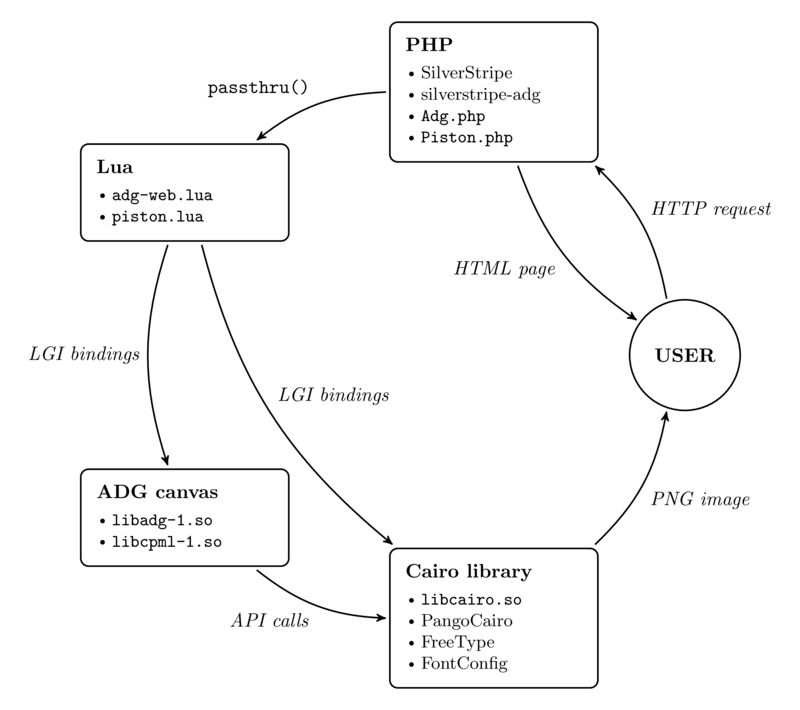 Without bindings the process would have been easy: only cairo (and consequently pixman) should have been updated (ADG requires at least cairo 1.7.4, released on August 2008). The bindings instead requires GObject introspection, a project quite picky on its dependencies. The drawings are generated by calling the adg-web.lua script with a passthru() call. 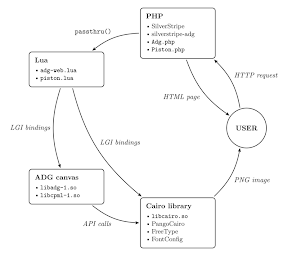 Although not a great choice on the performance side, this greatly reduces the maintaining burden on our side: adg-web.lua shares a lot of code with adg-demo.lua inside the piston.lua file. If ADG bindings are availables from PHP, nothing prevents you from generating the drawing directly from the PHP side, hence getting better performances. It is also possible to develop a CGI filter in C, if response time is a real critical factor.